Maxwell in Wings at Second Stage. I have no way of knowing if director John Doyle consulted Langewiesche’s book while mapping out his meticulously disarranged and death-defying, if not quite aerobatic new production of Arthur Kopit’s 1979 Wings, but the above passage comes close to capturing the show’s reeling, refracted carousel-of-consciousness and daredevil existential tilt. Wings isn’t about flying, per se. It’s about a woman suffering from a stroke — but staged inside her head, as her once-steady horizon is shaken like a bottle of unsettled vinaigrette. 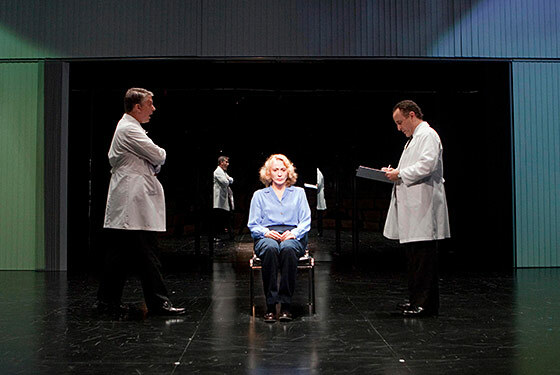 The condition is aphasia, and we meet the victim, Emily (Jan Maxwell, who is one of maybe three working actresses who could pull this role off), at the exact moment of catastrophe: Maxwell sits in a simple chair on what appears to be an empty stage, as gales of sensory confusion — cacophony, yammering, all dangerously unmediated, and disordered — buffet her from all sides. (Peter Nigrini gives a clinic in effective, anti-literal projection-work; Bray Poor’s sound design and original music is concomitantly non-obvious yet arresting.) As Emily attempts to correct for the pitch and roll of this new roiling reality, we gradually learn she was once a wing-walker, a mid-air acrobat from the barnstorming era who cartwheeled on the wings of biplanes. In other words, she’s uniquely suited to the challenge before her. That doesn’t mean Emily makes it look easy. Cyclonic fragments of sense-input slice through her constantly, usually at the precise instant she’s becoming adjusted to a new reality. She isn’t merely trapped inside her own mind, Awakenings-style: The place is coming down around her ears. Reality is breaking down on a semantic level, as her vocabulary is flooded with gibberish (“noddygobbit,” “globbidge” — Emily seems to prefer her stroke talk slightly Dickensian). Her very sense of an inner self, an essential consciousness, is being challenged: What does it mean to “recover,” to “get better,” when you may not be You anymore? But then, Emily is, at heart, an adventurer, a woman born to barrel-roll, and Maxwell, at her best, emanates animal fear and heroic ecstasy in nearly equal portions. Kopit (an intelligent, interested generalist who also wrote Indians and the libretto for Nine) researched Wings exhaustively, and the sheer rigor of his mind’s-eye depiction of aphasia might risk an over-fastidiousness in the wrong hands. Luckily, Doyle (the brain behind the groundbreaking, wall-dissolving Sweeney Todd of 2005, and the similarly liberated Company in 2006) is a master origamist of inter-folding realities, and every swoop feels spontaneous — if not always sufficiently ecstatic. I wish he and Maxwell had allowed Emily to soar just a little longer. As it is, we’re made to feel a bit more of her terror than her courage — which means, we’re denied some of the weird thrill of her death-defying dive. But this is a quibble: In a whooshing 65 minutes, Maxwell and Doyle deliver a tremendous theatrical head rush, and a priceless inverted view of consciousness itself. Langewiesche, in Inside the Sky, says that “flight’s greatest gift is to let us look around,” adding, “Mechanical wings allow us to fly, but it is with our minds that we make the sky ours.” Which Maxwell’s Emily would undoubtedly second with a “jungdaball!” and mean every syllollababble of it. Wings opened October 24 at Second Stage and runs through November 21.